César Brandon Ndjocu –yes, I’m not forgetting any surname- (Malabo, 1993). 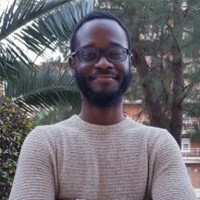 Community worker graduate at the University of Granada and educated socially by the strict and loving University Mummy, Daddy, brothers, sisters, one or another teacher from the Spanish School of Malabo and my four years in Ceuta –my second home-. Survivor of Hurricane Adolescence, and now active member of Tsunami Grown-Up Life. In love with my country, in my own way, because my country is married to another and is afraid of asking for a divorce.